A comparison of spectral indices for measuring the water status of conifer foliage using hyper-spectral sensing. We collected needles from piñon pine (Pinus edulis) and oneseed juniper (Juniperus monosperma) bushes and trees around the Earth and Environmental Sciences Division at Los Alamos National Laboratory. The needles were racked onto slides and their spectral reflectance signatures was recorded with a high-sensitivity field spectrometer. Water status of the sampled trees was measured using pre-dawn water potential sampling, and water content of the measured needles was found using dry-weight/wet-weight comparisons. We extracted a series of spectral indices from the recorded signatures, and compared their correlation with the water status measurements. For the most part, the winner was good ol’ NDVI, which had convincing correlation with water content and also water potential, especially for the piñon. Many fundamental ecosystem properties and dynamics are determined by plant water stress, particularly in dryland ecosystems where water is usually limiting. Indeed, under severe drought, plant water stress and associated insect infestations can produce landscape-scale mortality. Despite the fundamental importance of plant water stress in determining properties and dynamics at ecosystem and landscape scales, approaches for remotely sensing plant water stress are largely lacking, particularly for conifers. We evaluated the remotely sensed detection of foliar drought stress in two conifer species, Pinus edulis and Juniperus monosperma, which are co-dominants of extensive- juniper woodlands in North America, the first of which experienced extensive mortality in association with a recent drought. Needle spectra were made on these species in the field using an integrating sphere and portable spectrometer. Two indices of foliar water condition, plant water content (% of dry mass) and plant water potential, were compared to five spectral analyses: continuum removal of the 970 and 1200 nm water absorption features, the Normalized Difference Water Index (NDWI), the Normalized Difference Vegetation Index (NDVI), and the red edge wavelength position. 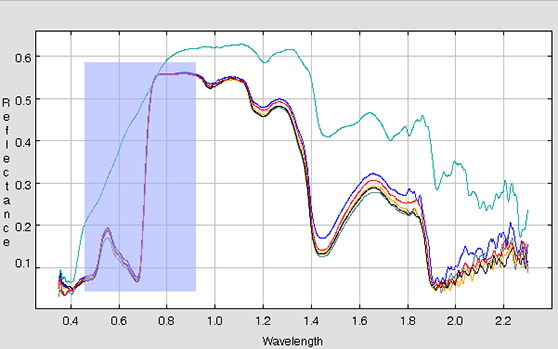 For P. edulis, plant water content was significantly correlated with four of the five indices: NDVI (R2 =0.71) and NDWI (R2 =0.68) which exhibited stronger relationships than 970 nm continuum removal (R2 =0.57) or red edge position (R2 =0.45). All five indices were significantly correlated with P. edulis water content when trees undergoing mortality were included in analyses (R2 =0.60–0.93). Although the correlations were weaker than for plant water content, plant water potential was significantly correlated with NDWI (R2 =0.49), 970 nm (R2 =0.44), NDVI (R2 =0.35), and red edge (R2 =0.34); again all five indices had significant relationships when trees undergoing mortality were included (R2 =0.51–0.86). The relationships were weaker for J. monosperma: water content was significantly related to 970 nm (R2 =0.50) and 1200 nm (R2 =0.37) continuums and NDVI (R2 =0.33), while water potential was related only to 1200 nm (R2 =0.40). Our results demonstrate a critical link between plant physiological characteristics tied to water stress and associated spectral signatures for two extensive co-occurring conifer species.